I’m not saying that how OSMRE designed its EIS, and how it was being carried out — and certainly not what the environmental and economic impacts of the buffer zone rulemaking — aren’t issues for congressional and public oversight. But for anybody who thinks congressional hearings are not real efforts at fact-finding and are just partisan political theater, this particular hearing sure backs up that thinking. One bright spot, though, is that the prepared testimony from Kitts and Lovett does provide some clear and fairly concise explanation of where the coal industry and environmental groups are coming in the continuing debate over whole mountaintop removal will be regulated. Permit delays and regulatory uncertainty are thwarting capital investment that will create and sustain the high-wage jobs needed and valued in our coal communities. At a time when our nation is recovering from a deep recession and requires low-cost and reliable fuel to remain globally competitive, agency policies are crushing these job-creating enterprises that will be the engine for our economic growth and prosperity. To all, with perhaps the exception of OSM, the statutory language and structure is clear—“exclusive” means just that, it does not mean parallel or concurrent jurisdiction with OSM. Thirty years of case law establishes the following principles of SMCRA: (1) the law sets out a careful and deliberate allocation of authority of mutually exclusive regulation by either OSM or the state, but not both; (2) in a state with an approved program that authority rests with the state; (3) states are the sole issuers of permits in which OSM plays no role; (4) OSM does not retain veto authority over state permit decisions; and (5) OSM intervention at any stage in a state permitting matter unlawfully frustrates the deliberate statutory design and allocation of authority. The coal-rich mountains of central Appalachia are home to generations-old communities and contain beautiful hollows through which thousands of pristine and ecologically rich mountain streams flow. 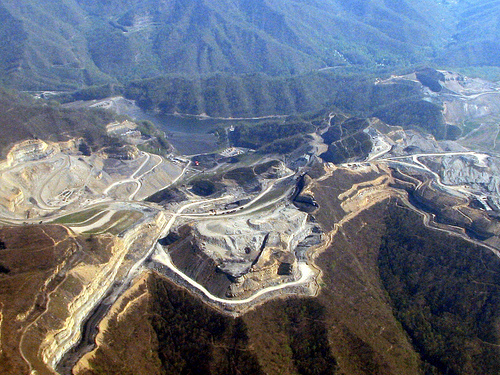 Mountaintop removal mining carelessly lays waste to our mountain environment and communities. The deforestation is not only an ecological loss, but a permanent blow to a sustainable forest economy in a region in desperate need of long-term economic development. Mountaintop removal has already transformed huge expanses of one of the oldest mountain ranges in the world into a moonscape of barren plateaus and rubble. Disregarding human and environmental costs, mountaintop removal coal mining as currently practiced in Appalachia eradicates forests, razes mountains, fills streams and valleys, poisons air and water, and destroys local residents’ lives. Toxic mine pollution contaminates streams and groundwater; hunting and fishing grounds are destroyed. Because the large-scale deforestation integral to mountaintop removal takes away natural flood protections, formerly manageable storms frequently inundate and demolish downstream homes. The toll on coalfield communities is tremendous. In the abstract, the Surface Mining Control and Reclamation Act (“SMCRA”) is an imperfect but useful law. Since at least 2001, however, the Office of Surface Mining Reclamation and Enforcement has refused to enforce the Act. The failure of OSM to carry out its duties has had devastating impacts on Appalachia. Appalachian coal is “cheap” because OSM ignores its duty to enforce SMCRA and allows the coal industry to pass its costs onto workers, communities, local and state economies, and the environment. The mining industry naturally takes advantage of federal regulators’ failure to enforce the law. I hope that that this Committee it will use the budget process to take action compel OSM to discharge its duties. I hope that it will require OSM to follow the clear science and the law. The absence of energetic oversight invariably leads to problems, particularly with agencies, like OSM, that have close ties with the industries they regulate. The collusion between the NOG’s and the Obama Administration is becoming more exposed every day – as it was yesterday. Also, did you watch the Ben Cardin hearing last year when the Dem’s had complete control – the politics of “hearings” swings both ways ! Do you always just trash the Republicans ? Lastly, there is now growing scientific consensus that streams are not becoming devoid of bugs as Gene mentioned. How many scientisits does it take to make a consensus ? It’s true that OSMRE entered into a settlement with some environmental groups over the buffer zone rule … We covered that in this Coal Tattoo post, http://blogs.wvgazette.com/coaltattoo/2010/03/22/enviros-cut-deal-with-obama-on-buffer-zone/ … But this was hardly some closed-door deal. The environmentalists had sued the agency, the agency decided to write a new rule, and they entered into a publicly disclosed settlement to put off litigating the Bush administration buffer zone rule until the Obama OSMRE publishes a new version … they could fight it out in the courts later. Given the administration’s intention to publish a new rule, litigating the old one seemed like a waste of time. Rush Holt, a liberal dem from NJ, did in fact show up, and gave opening remarks at 06:30. He was the ranking member present. I gather only 3 committee members showed up, however. I love their quorum size: 2! The rhetoric about “Permit delays and regulatory uncertainty” we hear often. But, when relatively innocuous definitive rules on conductivity are instituted by the EPA the rhetoric turns to, “Oh, the rules are too restrictive, blah, blah, blah.” It’s obvious to me that the industry doesn’t give a rip about the rules. Any rules that get in their way is too much. I personally would like to see other much more restrictive and costly testing done. I’d like to see requirements for Se, Hg, Cd, As, Fe, and other metal testing. This would go much further than simple conductivity testing and would be a cost and prohibition to the coal industry. I think the EPA really bent over backwards allowing conductivity in lieu of much more expensive metals testing. With the potential for GOP proposed budgets interfering with regulator agencies doing their jobs I think we should explore the possibility of agency sanctioned volunteer labor being at the disposal of regulatory agencies. I’m a retired analytical chemist and I would love to give some of my time to help the effort. I’ll bet you there are thousands of folks like me but they haven’t been given the opportunity. OSM set itself up for this failure. That OSM continues working on this “corpse” is even worse. There is no way that OSM will ever be able withstand legal challenges to this rulemaking. Joe Pizarchik is now beginning his 18th month as the OSM Director — few have lasted much longer.